The Primus Wind Power AIR 40 model 1-AR40-10-24 wind generator is for land use only and designed to work in medium to high wind environments. The body is constructed of permanent mold cast aluminum and the three blades are made of carbon-molded composite. The generator can be used for multiple types of off grid power applications including telecommunications, security systems, cathodic protection, cabins and trailers. It can also be used in conjunction with a solar system to supplement battery charging. The AIR 40 will produce 40 kWh per month with an average wind speed of 13 miles per hour and requires a start up wind speed of 7 mph. It comes with a built-in microprocessor controlled charge controller and the option of using an external load diversion controller. It can also be used with the MidNite Solar Classic with a Clipper unit to maximize energy production. 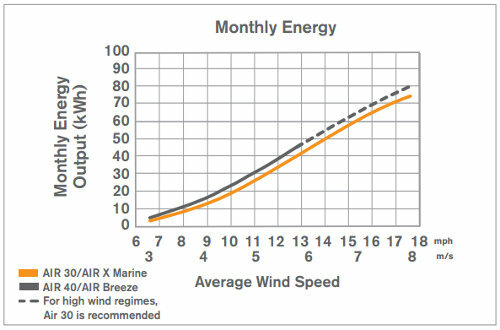 The wind generator cannot be connected directly to a power inverter. It must be used to charge a 24 volt battery bank. Your inverter will get its power from the batteries.